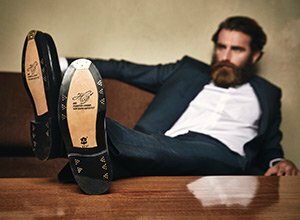 Classic cap-toe monk strap in black with two decorative buckles. Classic Norwegian in dark brown with open 4-eyelet lacing. Stylish kid leather quilted gloves featuring snap button closure and cashmere lining. Classic Chukka boot in black nubuck with Dainite rubber sole. Classic full-brogue Oxford in dark brown with closed 5-eyelet lacing. Classic cap-toe monk strap in dark brown with two decorative buckles. Classic Norwegian in black with open 5-eyelet lacing. Classic leather gloves made of kid leather with slit & cashmere lining. Stylish solution for gentlemen, who prefer to wear their favourite shoes even in bad weather. Classic plain Derby in red-brown with open 4-eyelet lacing. Elegant kid leather gloves with snap button closure & cashmere lining. Blue Derby boot in velours with open 2-eyelet lacing and EVA sole. Classic cap-toe Oxford in black-brown with closed 5-eyelet lacing. Brogue Derby boot in whiskey with hand finish, hook-eye lacing & rubber lug sole. Peccary gloves with decorative seams and soft cashmere lining. Classic cap-toe Derby boot in black with hook-and-eye closures.